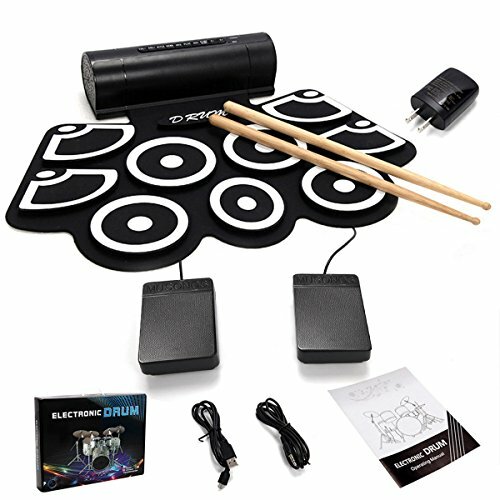 This Electronic Roll Up Drum Kit is a great value, and comes with everything a drummer needs to get started. This roll-up drum kit is composed of drum pads that emit realistic sounds, including: crash cymbal, ride cymbal, open/close hi-hat, snare, bass drum, high tom, low tom and fool tom. The fascinating set allows musicians to record funky beats and upload them to a computer with the connection. The thick drum pad can easily be rolled up, the portable and lightweight design of the compact kit makes it easy to take anywhere. This all-inclusive drum pad set provides enhanced sound with two pedals, one for bass and the other for hi-hat, providing more realistic feel than alternatives. These are great for beginners and younger individuals. View More In Electronic Pads. RTOM Black Hole Snap On Mesh Practice Pad - 13"
Aquarian Drumheads Super-Pad Low-volume Drum Surface - 12"
RTOM Black Hole Snap On Mesh Practice Pad - 16"